The interoperability of Bell’s UH-1Y utility helicopter with NATO forces was on full display during Trident Juncture 18, NATO’s biggest exercise in recent years held from October 25 to November 7 in Norway. Involving around 50,000 participants from 31 NATO and partner countries, the exercise was designed to enhance their ability to work together collectively to conduct military operations under challenging conditions and to operate together to defend populations and deter potential adversaries. 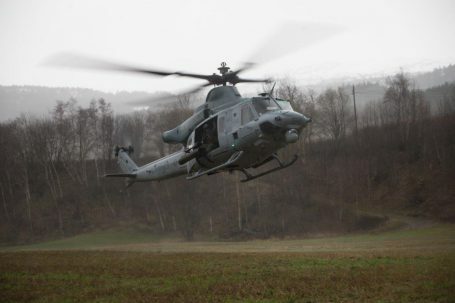 In one seamless operation, a UH-1Y ‘Venom’ helicopter patrolled overhead searching for enemy combatants, providing close air support for British Royal Marines during a Tactical Recovery of Aircraft and Personnel (TRAP) exercise in Rindal, Norway on November 6. The Royal Marines with X-Ray Company, 45 Commando, worked in conjunction with the 24th Marine Expeditionary Unit and assets from Marine Aircraft Group 29 to exercise their TRAP proficiency and bilateral interoperability. The UH-1Y, which the Czech Ministry of Defence is considering acquiring as part of its Multi-Role Helicopter procurement to replace the legacy fleet of aging Soviet helicopters, is the helicopter that the United States Marine Corps has chosen for its global missions over the next four decades. Regarded as the world’s ultimate combat-proven multi-role helicopter, the UH-1Y can operate in the most extreme environments, from the Arctic cold to the desert heat, while accomplishing a wide variety of missions, from combat roles to disaster relief. It’s tried-and-tested interoperability within NATO operations means it is becoming the preferred utility helicopter choice for a growing number of NATO and partner countries, including Romania, which plans to buy 21 Bell UH-1Y ‘Venom’ and 24 AH-1Z ‘Viper’ helicopters.